I look forward to our days together. You will learn about O’Keeffe and her approach to art, get inspiration from the subjects and landscape that she loved, and create your own works. We will be guided by the approach O'Keeffe learned (from her most influential teacher) to “fill a space in a beautiful way,” as we focus on line, color, and shape — while in the landscape that inspired O'Keeffe. But you will develop your own creative expression. This course provides an affirming artistic experience for all skill levels, from the novice to experienced artists who want to try something new and want to know about O’Keeffe, her life, and her art. Sessions morning (9 a.m.–noon) and evening (7–8:30 p.m.); afternoons free or in class (1:30-5 p.m.). Meals served at 8 a.m., noon, and 5 p.m. The studio will be open all hours for those who want to work during free times. Participants can sign up for an optional 1:30 p.m. O’Keeffe Landscape Tour (with an additional $37 fee) during an unscheduled afternoon. Thursday, March 14 Check-in begins at 3:00 p.m. at the Welcome Center. Ranch Orientation at 6:45 p.m. (after dinner); then we meet for introductions and a course overview. Monday, March 18 Check-out by 10 a.m.
Also Bring comfortable walking shoes, a brimmed hat, sunscreen, clothes for changeable weather (warm/cold, rain/snow/sun), and a water bottle. I will bring fixative and blending stumps (also called tortillons) for working in pastels and a variety of other materials for experimentation. ​Participants need to bring their own basic supplies listed above. This course is ideal for beginners and amateurs. It is open to experienced artists wanting a fresh approach. Novices will learn the most. Advanced artists will try exercises and get information that will help them understand O'Keeffe and her art. I first taught at Ghost Ranch in the 1970s, then returned in 2014 to lead annual O’Keeffe-related courses. 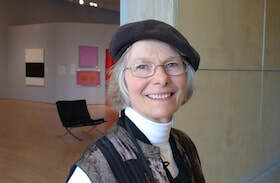 I have also taught at the Georgia O’Keeffe Museum (Santa Fe), Palo Alto (CA) Art Center, and San Jose (CA) Museum of Art. I have two art degrees (BA and MFA) and worked at art museums for 35 years, including 15 years at Stanford University’s Cantor Arts Center. Learn about me at my website: www.annakoster.com. Visit our Facebook group “Lessons from Georgia O'Keeffe's Art, Life, Landscape” at bit.ly/akOKgroup(“OK” must be upper case, the rest lower case); you can view posts or join the group to share there. • For its accuracy and detail, I like Roxana Robinson's biography Georgia O'Keeffe, first published by Harper & Row in 1989. Portrait of an Artist: A Biography of Georgia O'Keeffeby Laurie Lisle, from Washington Square Press, is also respected and is easier to read (fewer details). • If you have little or no experience drawing, that's perfectly OK. But if you want to get a head start before coming to Ghost Ranch, I suggest visiting your local library for a basic book on drawing for beginners. Avoid books where the authors appear to be showing off their skills rather than giving easy instructions. The only book that looked OK when I visited the store was Drawing Nature for the Absolute Beginner: A Clear & Easy Guide to Drawing Landscapes & Nature by Mark and Mary Willenbrink, published by F&W Publications Inc.